Sporting the name Ceylon in its days within the British Empire, Sri Lanka, the “Pearl of the Indian Ocean,” has known many identities on its journey to modernity. Famous for its peaceful Buddhist ruins, including the beautiful palace and frescoes of the 5th-century fortress Sigiriya, Sri Lanka enjoys year-round sunshine and breath-taking views of the Indian Ocean from every shore. Follow the coastal roads, pausing to breathe deep at the fish markets (or not) and capture the colorful sails of the local Karavas fishing boats on camera. 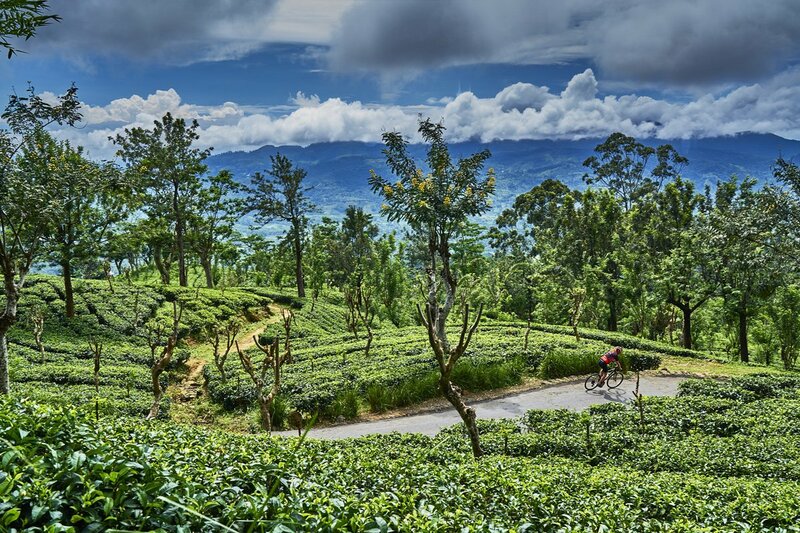 Catch the whiff of cinnamon being cooked as we cycle, and tackle the hill country outside of Kandy to reach one of the island's highlights; the tea estates. Sri Lanka’s landscape combines a great mix of challenging terrain and beautiful scenery; perfect for this tour. Cycle red dirt tracks which wind through the countryside, flanked by elephant grass—and maybe wild elephants too. Drink in the water gardens at Sigiriya, before climbing Lion Rock to awe at the views overlooking the ruins. A wildlife enthusiast? Sri Lanka offers the chance to spot a wide range of birds and animals in their natural habitat. From small creatures—like mongoose—and over 400 species of bird, to the world’s largest animals, the elephant and blue whale, Sri Lanka is a nature lover’s dream. Meet at the hotel for a trip briefing and welcome dinner. Riding along the coast, we pass the distinct patchwork sails of the Kara-vas fishing community. Turning inland on quiet back roads, we head to Dambulla to visit a 2nd century Buddhist cave temple. Ride on a mix of tarmac and red dirt roads passing orchards, paddy fields and elephant grass, we cycle to the ancient 5th century rock fortress Sigiriya, where we walk up 300 m to view the ruins of King Kasyapa's summer palace. After our descent, our afternoon ride follows an old irrigation canal. We transfer back to Polonnaruwa and ride around Parakrama and through Angammedilla National Park, a small forest reserve that is an elephant corridor linking two parks. Here, we follow the Ambon Ganga (river) to the foothills around Naula, said to be the centre of the Island. Lunch in the spice growing region of Sri Lanka before transferring onto Kandy. A rest day in picturesque Kandy -- an important Sinhalese religious centre and a place of pilgrimage for Buddhists. Explore old shops, antique and gem specialists, or the bustling market. A must see is the UNESCO World Heritage site of the Temple of the Sacred Tooth Relic. Prepare to tackle Sri Lankan hill country. Those who find hills a bit too challenging can take the train after cycling 21 km. From Gampola, we start to see the tea carpeted slopes of hill country and can stop to take photos of brightly dressed tea pickers and colourful Hindu temples. Reaching Hatton, we descend to one of the old colonial tea planter bungalows set in lovely gardens. There is a long climb with an easy gradient up to Bogowantalawa that takes us to a remote pass with dramatic views. The reward for the long climb is a stunning descent through small villages and tea country, ending close to Banlangoda. After lunch at a local restaurant, we transfer to our hotel on the edge of Udawalawe National Park. We cycle to Udawalawe National Park, one of the best parks to see wild elephants in Sri Lanka. You may also see wild buffalos, crocodiles, sambur deer, and monkeys. There are also lots of water fowl and hawk eagles to keep the photographers happy. After lunch, we cycle along an irrigation canal back towards our hotel. We bike through a network of back roads for some fantastic cross-country riding. It’s a quite a long, undulating ride with lots of fruit stops to break up the day. We try to get to the beach by early afternoon, so there is some free time to enjoy the beach or a nearby surf camp. Riding through open paddy fields and cinnamon estates, we arrive in Galle mid-morning with plenty of time to explore the fort. You are free to choose your own lunch venue, and we meet up again for a farewell dinner. We transfer hours to Colombo for the airport or hotel. Day 2 - Negombo - Dambulla Ride 54km. +402m / -364m. Our main guide was Waruna Jayawardane and he was outstanding. Probably the best guide of all four trips I have taken with SpiceRoads. Waruna was a wonderful tour leader! Our bicycle journey will be on quiet back roads, estate tracks, and gravel paths. We cover 575 km in 9 cycling days, and much, if not most, of the terrain is undulating, and there are three days with more than 70 km of riding. When you combine the great variety of cycling with the cultural and natural attractions, there is plenty to delve into and enjoy. Suitability: This ride is for those who have some biking experience, as well as experts. The beginning of this ride is relatively flat, but there will be hills as we head inland, and there are some long distances to cover. Never underestimate the heat and humidity of tropical Sri Lanka, as it will likely ensure things feel hot. This is a true journey through the finest terrain and scenery of Sri Lanka, with the best culture, nature, and wildlife along the way, ensuring you get the very best of everything from your cycling efforts. Biking Conditions: The road surfaces are mixed: most days we ride on reasonably good quality asphalt roads, but there are enough sections on very badly broken or dirt tracks that you will need a mountain bike, preferably one with front shocks. However, there is nothing technical involved on this tour, and anyone, assuming they have a reasonable level of fitness, will be able to join. A support truck is always available to help. Arrive in Sri Lanka and meet at Goldi Sands Hotel in Negombo for a trip briefing and welcome dinner. After breakfast, we start riding directly from the hotel along the old coast road. Keeping the sea on our left, we pass the distinct patchwork sails of the Karavas fishing community. Their boats pulled up along the beach or sailing just off the coast make for excellent photos as does the many fish markets you’ll cycle past. We leave the coast road after cycling for 30 km and head inland on quiet back roads that give you a flavour of Sri Lanka. After 50 km, we rack up the bikes and transfer 3 hours to Dambulla, breaking for lunch at Kununegala Lake. Dambulla, the 2nd century Buddhist cave temple, also known as the Golden Temple, is the largest and best-preserved cave temple complex in the country and contains more than 150 Buddha statues. Once we have taken in the views from the caves, we have a short transfer or ride to our peaceful hotel situated amongst mango trees and paddy fields. We ride through the countryside on a mix of tarmac and red dirt roads, passing orchards, paddy fields, and elephant grass. Riding along the shores of Kandalama Lake, we have excellent views of the ancient 5th century rock fortress Sigiriya (Lion Rock), our destination. We park the bikes and walk through the old water gardens before climbing 300 m to the view the ruins of King Kasyapa’s summer palace on the summit. To distract us from the walk up, we pass the impressive frescos that depict more than 500 ladies. After our descent, we head to a local restaurant for lunch. Our afternoon ride follows an old irrigation canal, and we cycle on red dirt roads, framed by long green grass, and see lots of people bathing as we head back to our hotel in Dambulla. Riding from the hotel, we have a bit of an ascent over the Kaladuwa Hills. The riding is on a good road surface, but wild elephants have been known to cross the road on the descent, so please beware. We ride on a tree-lined road that is part of a forest reserve until we reach Polonnaruwa Tank, a very large manmade lake, and lunch at a local hotel. We then ride through the historic park of Polonnaruwa, the 10th century capital and best preserved of the ancient cities. Abandoned in the 13th century, it was rediscovered in the 18th century and is now a UNESCO World Heritage Site. The Brahmanic monuments built by the Cholas and the chiselled stone monuments show us the glory of the ancient Rajarata Kingdom. After seeing the main sites, we have a 20-minute transfer to our hotel on the banks of the reservoir. A short transfer takes us back to Polonnaruwa, where we ride around the huge lake known as the Sea of Parakrama, named after the great king who built it. Part of the ride is through Angammedilla National Park, built to protect the water source. This small forest reserve is an elephant corridor linking Minneriya and Wasgomuwa National Parks. Here we retrace part of yesterday’s ride, following the Ambon Ganga (river) back towards its start point in the foothills around Naula, said to be the centre of the Island. We end the ride here to avoid busy roads and transfer to lunch in Matale, situated in Sri Lanka’s spice-growing region, and on to Kandy, the spiritual and cultural capital of the hill country and Sri Lanka’s second largest city. Nestled among hills and centred around a lake, picturesque Kandy has long been an important religious centre of the Sinhalese and a place of pilgrim-age for Buddhists. Today, you can explore the town centre’s old shops, antique and gem specialists, or the bustling market. A must see is the UNESCO World Heritage Site of the Temple of the Sacred Tooth Relic - Sri Lanka's most important Buddhist relic, a tooth of the Buddha. After a day of rest, we are ready to tackle hill country. For those who enjoy riding but find hills a bit too challenging, there is the option of taking the train for the final part into Hatton. A short 8-km transfer takes us out of town to Peradeniya, famed for its Botanical Garden and university. Starting the ride from the campus, we wind our way along a river valley with some short climbs opening out to the surrounding vistas, with our first tea stop in Gampola 21 km away; the optional train journey begins here. From Gampola, we start to see the tea carpeted slopes of the hill country. Riding at a gentle pace, you can stop to take photos of brightly dressed tea pickers and colourful Hindu temples. We regroup at the tea outlets brewing the best tea on the island, fresh from their respective estates. Reaching Hatton, we descend to one of the old colonial tea planter bungalows set in lovely gardens. Those taking the train will be met at the station and shuttled to the bungalow. 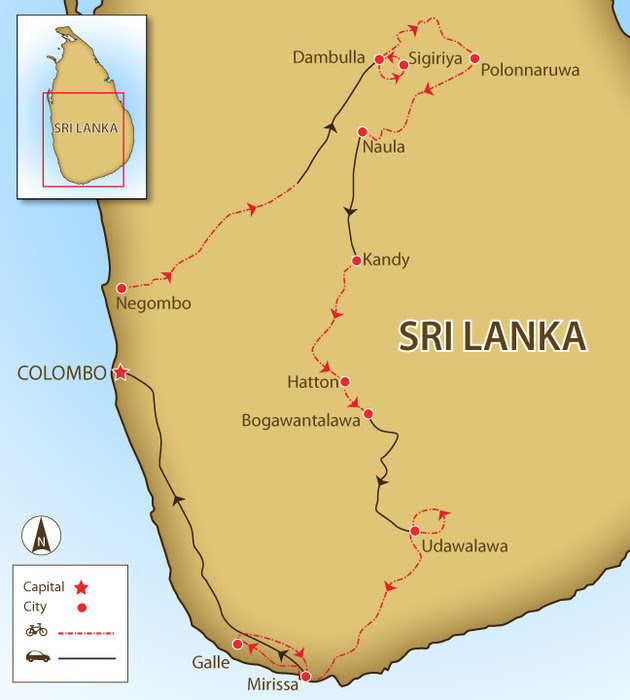 Today’s ride will be along tea estate tracks, through the heart of Sri Lanka’s tea growing region. You’ll be greeted by the pickers at work and their children as we head towards the Peak Wilderness and the distinctive triangle shaped mountain, known as Adam’s Peak. The long climb with an easy gradient up to Bogowantalawa gets tougher for the last 10 km to a remote pass with dramatic views. The mountain pass is part of the Peak Forest Reserve; its distinctive stunted forest contains many rare, endemic plants as well as the shy bear monkey more often heard than seen. The reward for the long climb is a stunning 30 km, 1000 m descent through small villages and tea communities, ending close to Banlangoda. After lunch at a local restaurant, we pack our bikes and transfer to our hotel on the edge of Udawalawe National Park, set on the banks of a lake. Riding from the hotel, we cycle 21 km to Udawalawe National Park, one of the best parks to see wild elephants in Sri Lanka. The park, centred around a reservoir, has approximately 400 elephants in small herds scattered around the park, and mid-morning is a good time to see them close to the water’s edge. We may also see wild buffaloes, crocodiles, sambur deer, and monkeys. There are lots of resident water fowl and hawk eagles to keep the photographers happy. We lunch in a nearby eco lodge and then mount our bicycles to follow an irrigation canal back towards our hotel. Riding from the hotel, we use a network of back roads for some fantastic cross-country riding. Here you get to experience southern Sri Lankan charm – lots of smiling faces and a slow pace of life. It’s quite a long, undulating ride, with lots of fruit stops to break up the day. Be sure to try one of the 14 varieties of bananas in Sri Lanka, each with its own taste and medicinal qualities, to give you energy. We try to get to the beach by the early afternoon, leaving you free time to enjoy the beach or a nearby surf camp. We will dine at one of the many nearby restaurants in the evening. Cycling through open paddy fields and cinnamon estates, we arrive in Galle mid-morning, giving you plenty of time to explore this historic masterpiece. The Dutch expanded the original fort to its present size, and later the British added the court complex and several other outstanding buildings. The different architectural and cultural influences meld to create a magnificent sight. You are free to choose your own lunch. and we meet up again for a farewell dinner. We transfer 3 hours to Colombo where we can drop you at the airport or to a hotel if you are extending your stay in Sri Lanka. Because some people can't imagine going on a trip without their own beloved bicycle, we do not provide them as part of this tour. However, you can hire bikes locally for the price listed in the tour pricing section. The bikes are specialised Hard Rock mountain bikes with lightweight alloy frames, 24- to 27-speed gearing, v-brakes, and front suspension. If you bring your own bike, please make sure it is a mountain bike, preferably with front suspension, in good mechanical order.